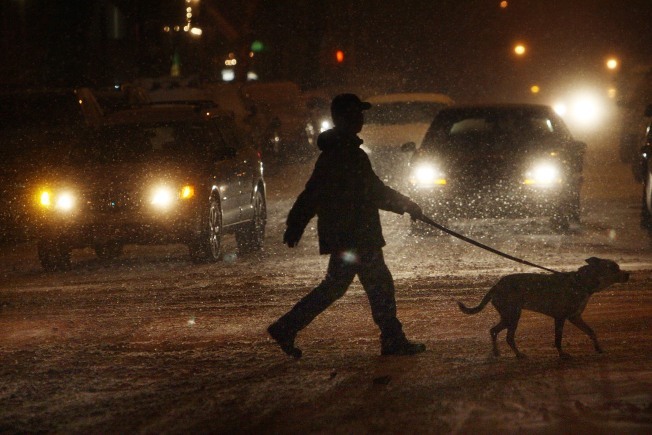 A person walks a dog down a snowy street in Brooklyn. A massive storm is slowly and steadily blanketing the tri-state region, keeping people home on what is traditionally one of the busiest shopping days of the year. The National Weather Service forecasts seven to 10 inches of snow and gusts of wind up to 30 mph for the New York City area. The brunt of the storm is expected overnight, with the white stuff tapering off in the early Sunday hours. When the snow started falling in New Jersey and New York, it came fast and hard. Gusts of wind were reported at around 25 mph in coastal areas. The MTA was putting its fleet of snow and ice-melting machinery into action to ensure minimal disruption to services over the weekend, officials said. The city also has 350 salt spreaders, 2,000 snowplows and 250,000 tons of rock salt ready for roads. As of 8 p.m., 311 had received approximately 28,000 calls, 378 of which were about emergency snow removal employment. By early Saturday evening the massive system had dropped snow through much of New Jersey, creating treacherous travel conditions in some areas. Numerous accidents and spinouts were reported, and speed limits were reduced on most major highways. The National Weather Service said 3 to 10 inches was already on the ground in some southern areas. On Long Island, accumulations could reach 16 inches and there's a blizzard warning in effect through Sunday morning. There's been dozens of accidents reported on the roads and officials are urging drivers on Long Island streets to take extra care. At area airports, scores of flights have been canceled. At LaGuardia and JFK, there were more than 200 scrubbed flights, though American Airlines and Southwest are still flying out. At Newark there's been 350 canceled flights. Of course, all cancellations are depending on weather so experts suggest checking with your carrier if you have plans to fly. The city is urging people to brush up on their winter weather safety and to check in on those who might be older, sick or need extra help during the storm. In addition to the snow, the tri-state area is going to be much colder than normal over the weekend as well, so if you have outside plans make sure to bundle up. Abnormally cold temps will probably moderate throughout the week, but it'll still likely be colder than usual for this time of year. So get your fires going. If you're hitting the roads, remember you can dial 511 for traffic and travel and transit info. The storm came from the Gulf and drenched South Florida with rain starting late Thursday, leaving flooded homes and stranded drivers. Water rose knee-deep in downtown Miami and more than a foot in Hollywood, 20 miles to the north. In Washington D.C., eight inches of snow have blanketed the city and surrounding suburbs. Greyhound buses between D.C. and New York have been canceled. It's too early to tell if it'll be a white Christmas, but for all you Jets fans out there who plan on watching Gang Green take on the Atlanta Falcons in the Meadowlands on Sunday, we suggest you bring a blanket – or two. Amtrak and NJ Transit said they were winterizing rail lines and other equipment and extra locomotives equipped with snow plows would also be available. The Coast Guard sent an airplane to fly from North Carolina to New Jersey warning boaters by radio to stay in port if they didn't have an urgent need to be on the water. As always, check back with NBCNewYork.com for constant updates on severe weather alerts, winter storm watches, flight delays and school closing. 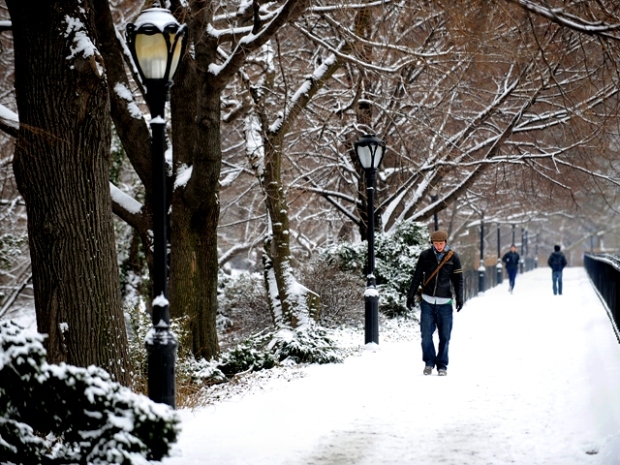 And send your winter weather pictures to isee@nbcnewyork.com.